What do Chinese emperors, Tibetan monks, European royalty, celebrities, and the lady next door have in common? Their love for Pugs. One of the Toy Breeds, Pugs may be small in size…but size is the only thing that’s small about them. Pugs have a HUUUUGE personality, unlimited affection, and an impressive historical background. And they’ve been able to maintain their popularity throughout millennia. If you’re considering owning a Pug, you won’t simply be getting a pet. You’ll be getting a companion. They’ll require gazillions of your attention and will drive you mad at times (perhaps even more often). But, you’ll love every bit of it. And, well, have you ever seen Pugs? Then, you get what I mean. 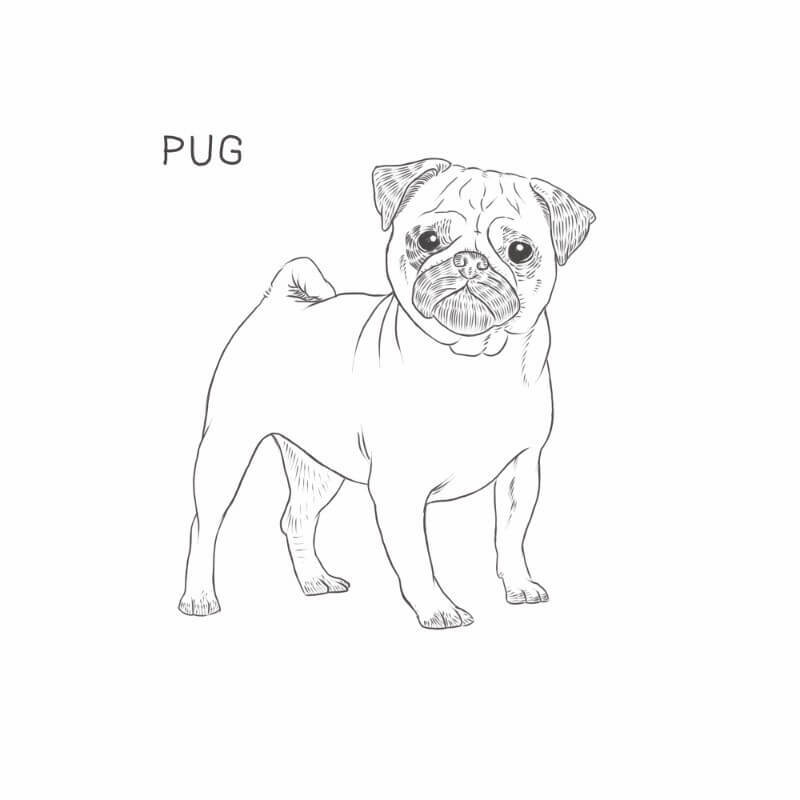 Let’s see whether a Pug is the right dog breed for you. Pugs may seem like a hot modern trend, but, in actuality, they’re an ancient breed. There’s a bit of controversy around the origin of Pugs. Yet, most available sources point to China. The most popular theory is that Pugs originated in Ancient China some 2000 years ago or, perhaps, even before that. Emperor Qin Shi Huang who ruled in the 3rd century BC and unified China is believed to have destroyed all scrolls that pertained to the history and origin of Pugs. Or, perhaps, he simply wanted to keep that information secret? Similar to how Shah Jahan killed everyone who’d worked on the Taj Mahal so that they would never recreate anything remotely resembling the beauty of it. Well, the man also died from mercury poisoning which he believed was an elixir to eternal life. So, we’ll never know what his true intentions were. Chinese emperors preferred flat-faced dogs and Pugs were developed and refined to suit their preferences. They were so fond of this dog breed that they not only used them as lap dogs but also gave Pugs as presets to high-ranking foreign individuals in countries like Korea and Japan. During the rule of some emperors, Pugs had their own servants, guards, and palaces. Emperor Ling To even ranked his female Pugs as equal to his wives. In the 16th century, as the Dutch East India Company developed routes from the Far East into Europe, they brought Pugs along. They became popular in European courts and stole the hearts of various European royals. Pugs were introduced to the US in the 19th century, and soon became a household favorite. Are Pugs Good Family Dogs? Pugs are playful and cheerful. They are intelligent and even have a sense of humor. They were bred to provide companionship and they excel at that. Regardless of whether that’s a family or an individual. Sometimes, people call them “shadows” as they tend to glue themselves to their owner and follow them anywhere. They’ll be happy to sit in your lap while you read, watch TV, or surf online, and will also readily join you in different activities. Pugs thrive on affection and will show tons of it in return. They are great with kids and enjoy playing games with them. Because of the shape of their mouth, they cannot bite very well. This too makes them great to have around kids. *Obligatory Reminder* Always supervise dogs and young kids, regardless of breed! Pugs can be a fragile breed, especially as puppies, so you need to be the attentive Wrestle Mania referee and curb the top rope soufflés from your kids. Pugs require a large amount of attention. However, when compared to other dog breeds, they are rather low-maintenance in terms of care. Feed your Pug a healthy and nutritious diet. This is the best dog food for Pugs. Your choice of meals and snacks will determine the health of your dog for years to come. Pugs are prone to gaining weight, so, scheduled feedings work best. Otherwise, pugs will keep eating because they love food. They can also be sensitive to certain additives in foods which makes it even more important to select high quality dog food. Because Pugs are small, they don’t eat much food (compared to a Lab, for example), and the dog food bag lasts longer….so it’s easier on your wallet, even if you choose a top-notch dog food. Despite having short fur, Pugs shed rather heavily. Since they are primarily indoor dogs, they’ll shed all year long. In addition to that, they’ll also blow their coat twice a year. Brush your Pug weekly for about 10 to 15 minutes. During shedding periods, brush several times a week or even daily. Use a soft or medium bristle brush with bristles that are close together. Those will work best for the short hair. It will also be easier to remove it from the brush when you’re done. Every 3 weeks is best. Bathing will loosen the hairs and help remove them. You can use a special pet hose with a brush that’s built it. Alternatively, use a brush while you’re washing your dog and once more after you’ve washed and dried it. You also need to trim a Pug’s nails. However, the largest issue is caring for a Pug’s wrinkles and ears. The skin folds can be excellent ground for infections such as skin mites. Make sure to clean in between your Pug’s wrinkles and remove any dirt that may have accumulated. Pugs need exercise. Not as much as some other more active breeds, but likely more than you think they should. Exercise is necessary to keep your Pug in good shape and good health. Take your dog on regular 20-minute walks twice a day. Having a yard for her to run around in is an added bonus, but not a necessity. When your Pug is still a puppy, avoid allowing it to do strenuous activities, overexert itself, or jump on hard surfaces. This can damage its joints and contribute to more joint issues later on in life. Opt for gentle play instead. Despite being intelligent dogs, pugs also tend to be rather stubborn and independent. So training them isn’t always easy. In addition to that, they tend to get bored with any repetitive tasks and may just refuse to do anything that you want them to do. So…imagine it staring back at it with cute puppy eyes while you are trying to get it to do things. Arm yourself with the patience you’d need to train a teen. Pugs are healthy dogs, but all dogs have their health issues. …and some of them can end up being rather expensive. So, if you are going to get a Pug, make sure to do so through a reputable breeder. They are doing genetic testing that will be able to tell the state of health of any puppy as well as that of their ancestors several generations back. It won’t rule out health issues, but will give you a much more accurate account of a Pug’s health. While the theory about the Chinese monarchs remains the most popular one about the Pug’s origin, another suggests that Pugs originated in Buddhist monasteries in Tibet. Monks used them either as pets or guard dogs. Or, they may have kept Pugs because they resembled Chinese Imperial guardian lions. Chinese call them Fu dogs, stone lions or simply shi shi. They placed a pair of them before temples, imperial palaces, or other important buildings to protect them from evil spirits. Chinese Happa dogs, a breed that’s extinct now. It’s not entirely clear which came first – the Pug or the Chinese Fu dogs. Neither it’s entirely clear whether this breed originated in Tibetan monasteries or the Chinese royalty. Yet, Pugs were important to both. A Tibetan legend too offers a take on the origin of Pugs. It says that if a human touched a newly hatched eagle than it turned into a Pug. Curiously, the Tibetan monks referred to these Pug dogs as hand dogs. Thankfully, not all records about Pugs were destroyed. About 551 BC, Confucius (yes, the famous Chinese philosopher) referred to “short-mouthed dogs” in his writings. When humans have wrinkles, it’s a bad thing. It’s quite the opposite for Pugs. They aren’t just another adorable feature of this breed, but actually used to carry a deeper hidden meaning. It’s believed that the extra flaps of skin could form the ancient Chinese characters. It was particularly special if you could read 王子 (prince) in your Pug’s forehead. The Pug used to be the official dog of Holland’s House or Orange. That happened after a Pug called Pompey prevented the assassination of the crown prince, William of Orange. The assassins tried to sneak up on the prince and murder him in the middle of the night. The dog apparently started barking and even jumped onto his master to alert him about the intruders. Before marrying Napoleon, Empress Josephine had a Pug called Fortune. Fortune was quite possessive of his mistress. He slept in her bed and wasn’t that fond of men being around her. On their wedding night, Napoleon decided to remove Fortune from the bed. This wasn’t a wise decision. The dog ended up biting him and Napoleon had no other choice than to share the bed with him. After having been so important during history, Pugs had to make it into Hollywood. Pugs are the favorite pets of various celebrities such as Gerard Butler, Hugh Laurie, Paris Hilton, and many more. But that’s not it. Does Frank the Pug sound familiar? Men in Black wouldn’t have been the same without him. As a matter of fact, the Pug who played him got a bigger role in the second movie because the director was extremely impressed with his performance in the first. Brachycephalic is a fancy word for flat-faced and refers to dog breeds such s Pugs, Bulldogs, Boxers, Lhasa Apso, and others. Brachycephalic breeds frequently suffer from respiratory issues. That’s because their upper jaw is really short but the tissues within are larger than what the jaw can hold. So, this overcrowding can cause airway issues. This is also why Pugs snore and make a ton of other nasaly noises. If your Pug is snoring so loud that you can’t hear yourself think, most of the time, there are a few things that you can do to make your life and sleep easier. One of them is a pillow that supports its head. Another alternative is a round bed. Dogs that sleep on their backs are more likely to snore and a round bed prevents them from being able to do that. They are more likely to curl up, and dogs who sleep curled up are less likely to snore. You won’t stop your Pug from shedding, but you can make sure that there is less hair around. Get a good vacuum cleaner. You may not want to hear that, but there will be hair. No matter how well you brush. So, having a good vacuum cleaner will make a difference when it comes to a hair-free home. Do grooming outdoors. But only in nice and warm weather. Pugs tolerate neither the heat not the cold. Get a black Pug. They don’t shed. Just kidding. They do. But a lot less. Black Pugs have only one coat while fawn Pugs have a double one. Double coats have a shorter lifespan, so it’ll shed at a faster pace. Get clothes and soft furniture that match your Pug’s color. This way, the hairs will be less noticeable. Plus, you and your Pug will look like twins. Well, almost. Pugs thrive in moderate temperatures. Around 65-75 degrees Farenheit is ideal for them. Yet, they’re not good with heat. They can easily overheat. Despite having a double coat, Pugs aren’t Samoyeds or Huskies and don’t do well in cold weather either. That doesn’t mean that you need to keep your dog indoors at all times. It needs daily exercise and to do its business. Get your Pug a warm outfit for the cold weather. Protect its paws by applying paw balm every fortnight. Protect it nose from getting dry and chapped. You can do that by using a special nose balm. Make sure that your heating system doesn’t dry up the air. Use a humidifier if it does. When the weather is hot, take it outside early in the morning and late in the evening. Keep it in the shade. Provide plenty of cool water. Blast the AC when indoors. Your Pug will thank you for that. Perhaps not, but it will definitely feel much more comfortable. While you can definitely teach a Pug how to swim, they are at a disadvantage here. Compared to other dogs of the same size, Pugs are heavier in terms of weight. They are also prone to being overweight. Pugs have broad faces and short muzzles. Because of that, they’ll instinctively tilt their heads up. This means that their butts will go down and they’ll start to sink. They can also overexert themselves trying to stay afloat. A lot of people call Pugs lazy. Perhaps it’s because they can sleep approximately 14 hours a day? However, that doesn’t mean that Pugs should be sleeping all day. Pugs need daily exercise to keep their weight in check as well as their hearts and lungs healthy. Make sure to spend some active time with your Pug. It’ll get its beauty sleep while you are asleep or at work. Most Pugs have curled tails and it’s one of the breed standards according to the American Kennel Club. The majority of Pugs have one curl. However, it’s extremely desirable to have two. What if your Pug’s tail has no curls at all? By no means is it less of a Pug. Nonetheless, you’ll have a much harder time if you decide to take part in shows. Less is more, but not when it comes to Pugs. Some use the Latin phrase multum in parvo when speaking about Pugs. This means “a great deal in a small place”. Pugs may be small dogs but they have a humongous personality. OK, now go find a Pug and see if you can identify any Chinese characters on its forehead. Or just simply cuddle it! Do Pugs Like Water? Swimming? Bath Time? Copyright © 2019 Dog Breeds List | Powered by Kibble | This site is owned and operated by Fivehead LLC, a limited liability company headquartered in Colorado, USA. Fivehead LLC is a participant in the Amazon Services LLC Associates Program, an affiliate advertising program designed to provide a means for sites to earn advertising fees by advertising and linking to Amazon.com.